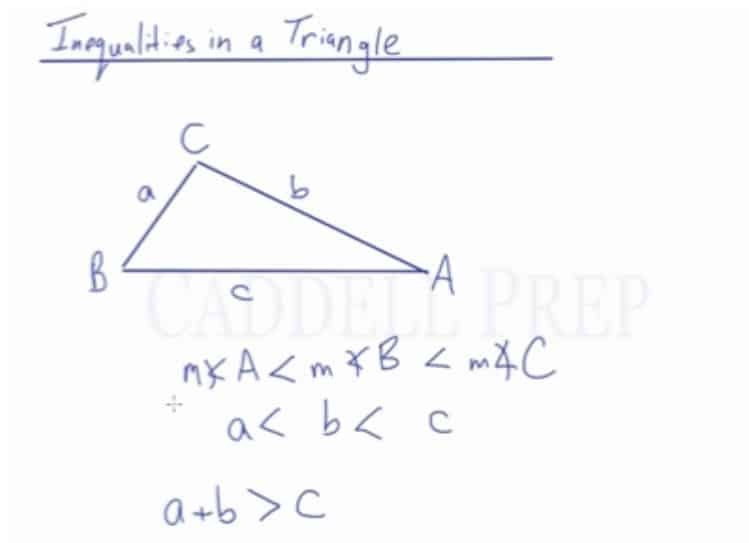 In this video, we are going to look at inequalities in a triangle that exists among the measures of the angles and the lengths of the sides of a triangle. First, let’s name the angles A, B, and C. Then, let’s name the sides a, b, and c. The sides and angles correspond to being directly across from one another. Let’s go over inequalities in a triangle. Let’s name these angles , , and . The side across from angle we’ll call . The side across from angle , we’ll call . And lastly, the side across from angle , we’ll call . In this diagram, we can see that the measure of angle is less than the measure of angle and that’s less than the measure of angle . is the smallest angle, followed by angle , and is the biggest angle. The lines are also in the same order. Since is the smallest angle, side is also the smallest side. Side is bigger than . And is the biggest. In inequality, if is the smallest angle, the side across from it is also the smallest side. If is the largest angle, then the side across from it is also the longest side. And the sum of the two small sides has to add up to be greater than the longest side.